We are closing in on the end of Lent. Wikipedia (whose audience is the general public and not Lent-observing Christians) explains 'The purpose of Lent is the preparation of the believer for Easter through prayer, doing penance, mortifying the flesh, repentance of sins, almsgiving, and denial of ego.' We have very few friends who are doing any of those things, and certainly none doing all of them. Prayer, penance, repentance, almsgiving, and denial of ego are all excellent ideas, even outside Lent. Mortifying the flesh doesn't seem to be right for Anglicans in modern times. 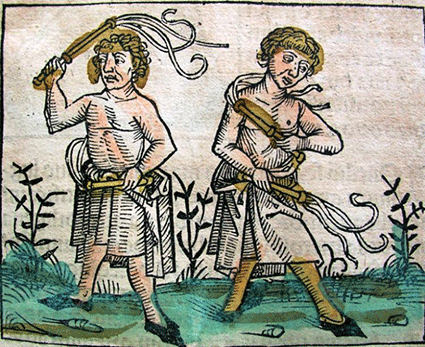 Wearing sackcloth might get you detained by the police, and self-flagellation (even though Martin Luther is said to have done it regularly) has of late had more connotative meaning outside the church than within. These Lenten activities are all traditional, and were in the beginning suggestions by bishops of techniques for accomplishing the real goal of Lent, which is preparation for Easter. As happens so often with the passage of centuries, the centre of attention of Lent has changed from the goal to the process. We sometimes attend a church in our home country that can be accessed only by automobile or by fit young hikers (of whom there are none in the congregation). It is on a steep hillside, far from any public transit. Bicycle paths route around it, and few bicyclists will brave those hills. The rectory is tucked away in a corner of the large car park. So everyone except the rector drives to church, some from a fair distance. Like so much else in modern life, it seems that Lent is being customised and personalised. What matters is that you prepare for Easter, not the details of how you do it. If you find that following the ancient traditions works best for you, then do it. If mortifying your own flesh helps you better come to an understanding of Jesus' passion, so be it. Just don't put it off until the morning of Palm Sunday. If you get to church next week and are startled when someone hands you a palm frond, then you got it wrong. If you haven't started your own preparation for Easter, then you should start now. Right now. Close this window and begin. See you next week. Hopefully you will be ready.